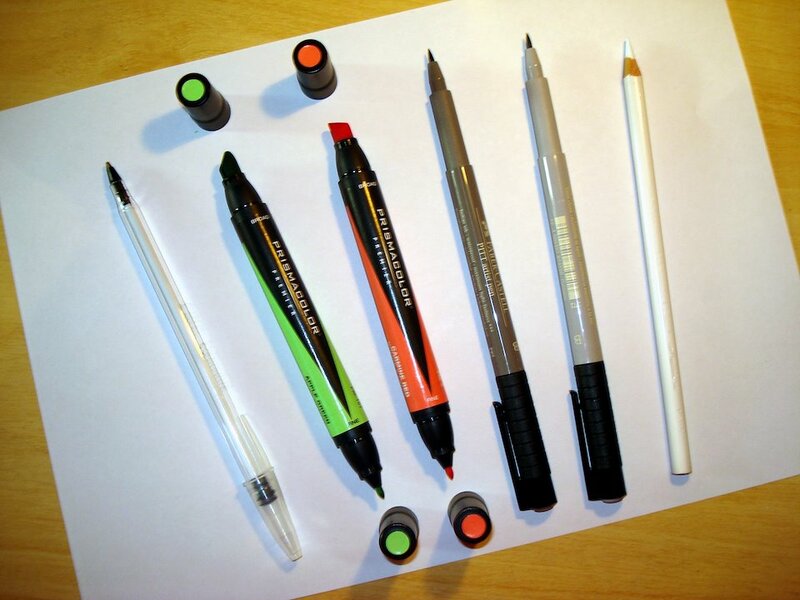 two fine/soft brush nib markers (medium cool grey and light warm grey), and a white soft lead pencil. 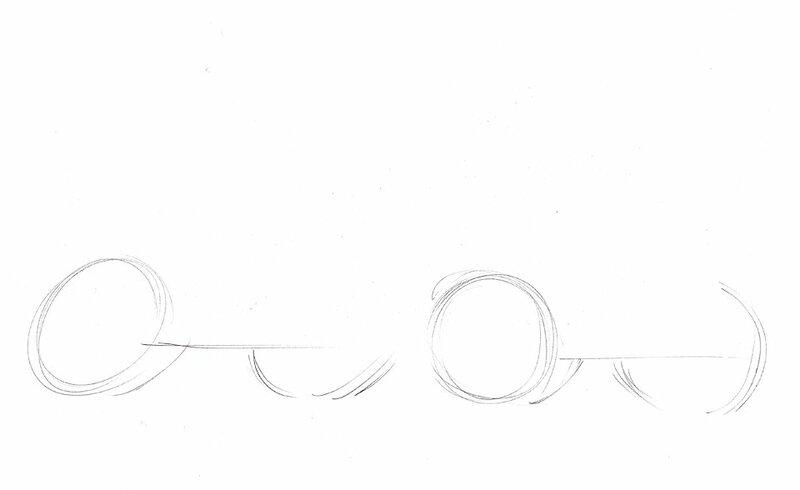 Lightly draw the side wheel ellipses, but suggest the far side ones. 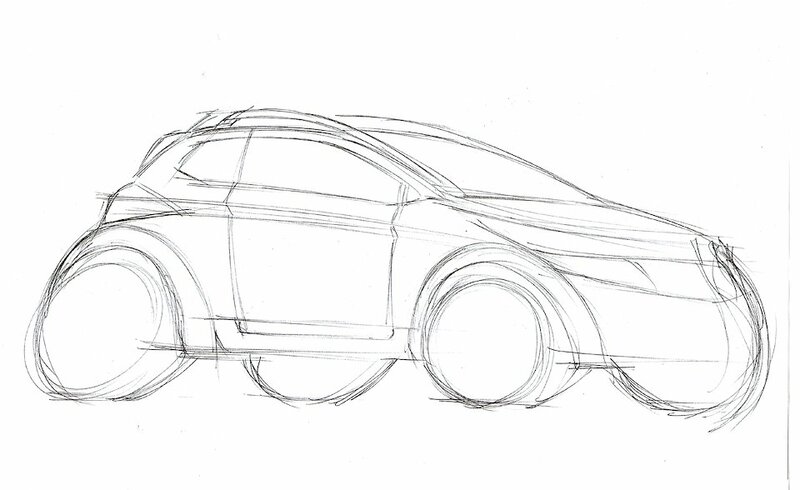 Add a personal trick: distort the perspective of the rear ellipses to get a little cartoonish flair to the sketch. This cartoon trick gives the impression that the rear wheels are kind bonded to the ground when the vehicle starts moving fast, which is not the current case. Here it is intended to give a more dynamic feeling to the vehicle. Also notice that wheels are a little different in size and rocker line is higher than normal due to the SUV character. 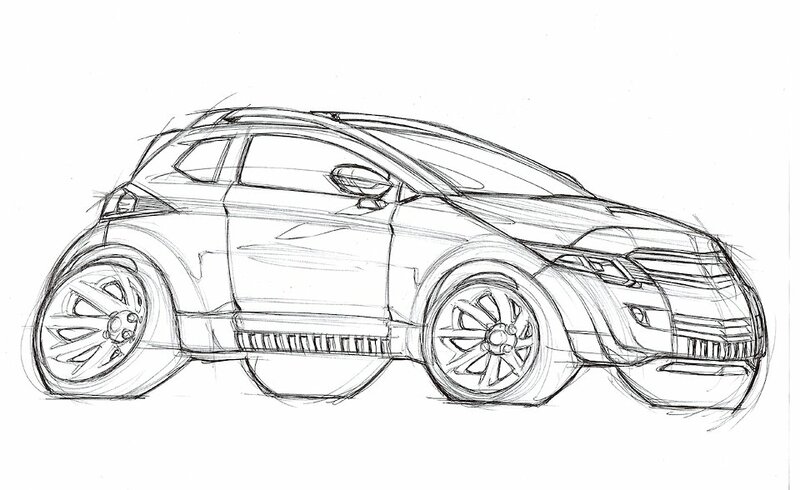 Lightly draw the vehicle profile and main character lines without detailing too much. Roughly place and scale the main design elements like lamps, wheel arches, DLO and door cut lines. Always remember to get all the elements you judge necessary to compose the rough sketch, like the rear spoiler and roof racks here. Reverse paper, look at it against the light and make adjustments where you think you should. Time to firm lines up. Use medium to strong weight to emphasize everything that does not represent surface transitions/shades or environment reflections. Some details require a balance between light and medium weight lines like some small components and those elements behind translucent parts as the lamp lenses. Move to shading. 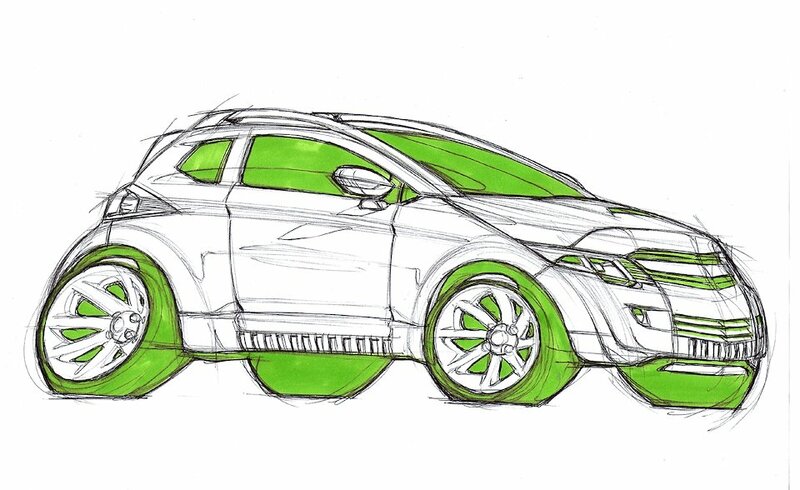 Use the light green marker, chisel and fine nibs, to fill the DLO areas, tires, wheel openings, front air intakes, lamp dark areas and the underbody. Notice that the far side front wheel was pushed very close to the bumper profile. The intention, after applying the light green, is to kind create a background to emphasize that region shape. Use the light red marker chisel nib to fill all the areas with the same color, which represent reflection and shade over the body. Use the marker fine nib to apply some lines closer to the reflection/shadow areas and the big transition fillets of the hood and front fascia surfaces. 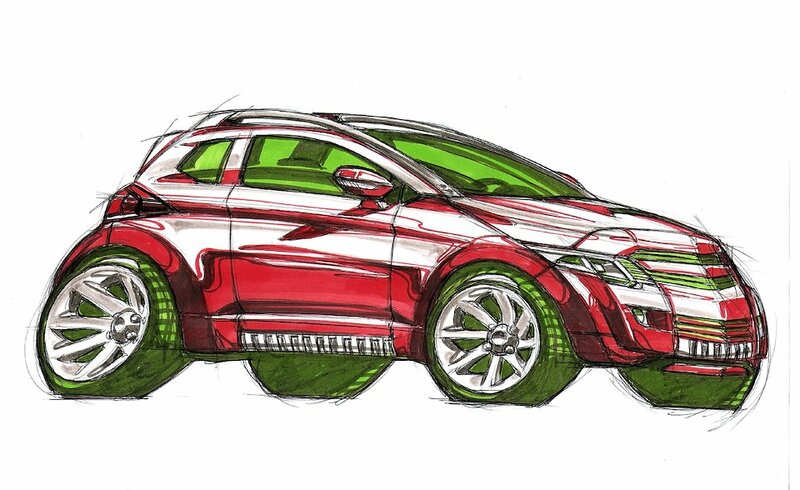 Use the medium cool grey marker (soft brush nib) to darken the wheel openings and tires, living light green spots on top to suggest the tire treads. Also suggest the inner far side pillars, steering wheel and cluster binacle. Darken part of the side window reflections and the far half of the fascia grille. Notice that the soft/flexible nib comes handy to enhance some of the body color area reflections. It allows better contour and line thickness control on a single strike. Besides, all the cool grey touches help on the metallic paint aspect of the body color parts. Before moving forward, use the red and the cool grey on the tail lamp as well. The cool grey was also applied to the wheel, hub cap and bolt shadow areas. Also two cool grey horizontal lines were added to enhance material aspect of the front and side aluminum rockers. Now, change for the light warm grey marker to shade the wheel upper spokes and white areas to lightly dim down the high contrast. 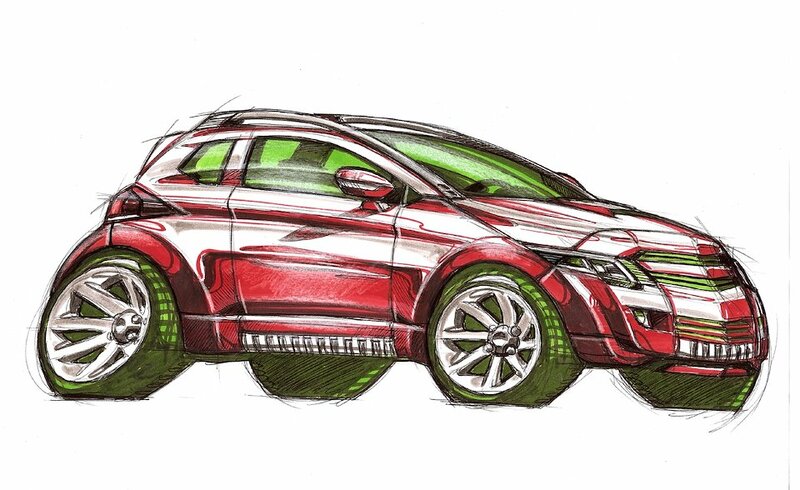 End up with the white pencil, applying subtle gradients on the door, window glasses and wheel arch upper portions. Gradients should fade outwards to indicate where lighting is more intense. Also use the pencil to highlight some fillets and body part flanges. Well, the work on the vehicle is finished, but this is a good example where something else has to show up to make others realize the intended vehicle size. Well, this is the MINI SUV, right? So, draw the human figure besides or behind it. The figure or, in this case, the girl is properly scaled to indicate the concept small size. The goal here is to show a simple and effective way to professionally represent a design concept. None of the following step images was digitally retouched, but scanned.